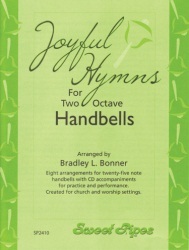 This collection of 8 hymns presents arrangements playable on 25 note handbell sets by "first time" players and moderately advancing performers. Each arrangement includes both melody and descant parts with chord symbols indicated. The CD includes both practice tracks (with bells) and performance tracks (without bells) for each song. Song list: All Things Bright and Beautiful, God of Grace, Fairest Lord Jesus, Joyful Joyful, I Love Thy Kingdom, Lead On O King Eternal, My Father's World, Wayfaring Stranger. Click here for sound sample of "Fairest Lord Jesus"
Click here for sound sample of "Lead On O King Eternal?"